I was reluctant to read this book at first--a book club selection. I'm not really an advice columnist kind of girl. 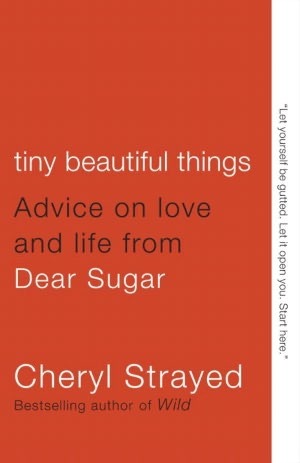 Well, as it turns out I'm not a typical advice columnist kind of girl (I say this having grown up reading Dear Abby and Ann Landers) and Cheryl Strayed is certainly not your typical advice columnist. Part memoir, part advice column, the questions and answers here are universal yet unique (my favorite question in this book was the short letter that simply implored, 'Dear Sugar, WTF? Can you just tell me WTF?!) and Strayed answers are heartfelt and profound--sometimes simple, sometimes complex. Always thought-provoking. I am an admitted sap so perhaps I'm not the best critic for this book--it had me crying more times than I can count at this point. It had many of my much more chill, not-so-sappy friends crying too, however. So there's that. If you don't read this book at least go online and Google "The Human Scale" and read that particular question and answer (all columns here are culled from the Dear Sugar column from the Rumpus). Please just do that for me. Oh, and she also references one of my favorite Lisa Germano songs in such a way that I felt as though she'd crawled inside my 25-year-old head so even if I'd hated the rest of the book, I probably still would've given it 5 stars just for that. Sign into Goodreads to see if any of your friends have read Tiny Beautiful Things. 25.0% "I didn't think I'd particularly care for an advice book but so far this is tearing me apart. In a good way." Wow. I've been thinking about reading this, but was on the fence. But a Lisa Germano reference? I'm in. Thanks for the heartfelt review and recommendation.